Final blood moon comes & goes; End of Days postponed…again! People who suffer from depression and mental illnesses sometimes become so distraught that they become suicidal. For Michelle Carter and her boyfriend, Conrad Roy III, the combination of a distressed young man and encouragement to kill himself from his girlfriend eventually proved fatal, according to Massachusetts authorities. Carter was charged with involuntary manslaughter when 18-year-old Roy committed suicide at the insistence of the then 17-year-old Carter, according to prosecutors. Text messages purported to be between the couple show how Carter researched then provided, in graphic detail, different methods Roy could use to take his own life. The messages also allegedly show that Carter actively encouraged Roy to carry out his suicide as soon as possible. Although their relationship lasted for two years, they had only met a few times before Roy’s death on July 12, 2014, according to prosecutors. 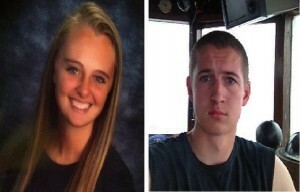 Police say that the macabre relationship began online and Carter and Roy communicated mostly via text messaging. It was these messages, recovered by police, that eventually lead authorities to charge Carter with Roy’s death. The online relationship took a deadly turn after Roy reportedly made several statements that he was considering killing himself. The recovered messages indicated that Carter apparently grew impatient with Roy because he appeared to only be toying with the idea. This is when police say Carter actively began to encourage Roy to carry out his tentative plans. It’s now or never, read one message, prosecutors said. Roy: How was your day? Roy said he was having a good day. CARTER: That’s great. What did you do? ROY: Ended up going to work for a little bit and then just looked stuff up. CARTER: When are you gonna do it? Stop ignoring the question??? Family members said that Roy suffered from depression and had made a previous attempt at suicide but they had become confident that he was making a recovery. “He seemed to be pulling out of it,” his grandmother Janice Roy told WBZ. Carter allegedly began regularly soliciting Roy with ways to kill himself before apparently deciding that carbon monoxide poisoning was the best way and instructed Roy to attach a rubber tube to the exhaust of his truck then place it into the cab. “for five or ten minutes, you will die,” she told him. “You lose consciousness with no pain. You just fall asleep and die,” she noted. “I bet you’re gonna be like ‘oh, it didn’t work because I didn’t tape the tube right or something like that,’” she texted him “You always seem to have an excuse,” according to one message. On the day of Roy’s death, authorities said Carter was in contact with him throughout the day, exchanging final messages with him during the last moments of his life after he had traveled to a parking lot where he used a gas water pump to take his life. Roy was found dead from carbon monoxide poisoning on the following day. Carter allegedly told a friend several months later the she could have prevented Roy from killing himself. “Even though I could not save my boyfriend’s life, I want to put myself out here to try to save as many other lives as possible,” she wrote in a Facebook post. Do you think that Michelle Carter should be charged for the death of Conrad Roy? Sound off by leaving a comment. ATTENTION: There is no war between black people and police… Yet! When I think that events in life cannot become even crazier, then stories like these change my thinking.